Description: Let the Children Come to Me Rosary is prayed in the back of the church after the Wednesday Children’s Mass. We are asking Mary’s intercession to remove the obstacles in the lives of all children that prevent them from coming to, or remaining in, Jesus. Everyone is welcome to stay and pray for the children. Description: The Sacrament of Reconciliation is available every Thursday at NOON at Blessed Sacrament or by appointment by calling the Parish Office. 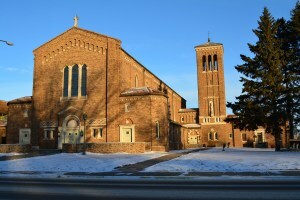 Description: On the 1st Saturday of every month, a Mass in Latin is offered at 8am at Immaculate Conception Church. Everyone welcome. Description: The Sacrament of Reconciliation is available at 11:00 am at Immaculate Conception Church every Saturday Morning or by appointment by calling the Parish Office. Description: The Sacrament of Reconciliation is available at 3pm on Saturdays at Blessed Sacrament Church or by appointment by calling the Parish Office. Description: Building up our parish family! Join us for coffee &.. in St. Leo's Hall each weekend after the 10am Mass. Description: Council of Catholic Women All women of the parish are members and are invited to participate through prayer and service. Currently CCW supports or sponsors, in varying degrees: Pregnancy Life Center, soup suppers, outreach to missions, the Fall Festival, parish mailings, Minnesota Citizens Concerned for Life, and outreach to the needy. Women may choose which activities they would like to participate in. There is a call and a place in CCW for all Catholic women. Meetings are held generally held the first Monday of the month at 1pm in the Courtyard Annex, September through May. For information call the Parish Center at 262-5541. Description: A rosary for life is said every Tuesday morning to pray for the of abortion. Description: For those who have attended a Cursillo weekend. Description: Mass is celebrated with the residents of Guardian Angels every Tuesday at 2:30 in the Chapel. Description: Grief support is available in the parish through intercessory prayer, support groups and individual counseling. A group meeting is set up for every Tuesday evening from 6-7pm in the Multi-purpose Room in the Parish Center. For information contact the Parish Center at 262-5541. Description: All Parishioners are invited and encouraged to attend this important Holy Hour offered for the sanctity of marriage and family life. Description: Youth for Life works in conjunction with Together in Life to promote the Culture of Life to the students of Assumption Catholic School. 5th & 6th grade students gather for lunch and a brief presentation on a specific life affirming issue and end in prayer. For more information or to get involved, contact the Parish Center 262-5541 This group meets Sept-May. Meeting days may vary due to days off of school. Let the Children Come to Me Rosary is prayed in the back of the church after the Wednesday Children’s Mass. We are asking Mary’s intercession to remove the obstacles in the lives of all children that prevent them from coming to, or remaining in, Jesus. Everyone is welcome to stay and pray for the children. The Sacrament of Reconciliation is available every Thursday at NOON at Blessed Sacrament or by appointment by calling the Parish Office. On the 1st Saturday of every month, a Mass in Latin is offered at 8am at Immaculate Conception Church. Everyone welcome. The Sacrament of Reconciliation is available at 11:00 am at Immaculate Conception Church every Saturday Morning or by appointment by calling the Parish Office. The Sacrament of Reconciliation is available at 3pm on Saturdays at Blessed Sacrament Church or by appointment by calling the Parish Office. Building up our parish family! Join us for coffee &.. in St. Leo's Hall each weekend after the 10am Mass. Council of Catholic Women All women of the parish are members and are invited to participate through prayer and service. Currently CCW supports or sponsors, in varying degrees: Pregnancy Life Center, soup suppers, outreach to missions, the Fall Festival, parish mailings, Minnesota Citizens Concerned for Life, and outreach to the needy. A rosary for life is said every Tuesday morning to pray for the of abortion. For those who have attended a Cursillo weekend. Mass is celebrated with the residents of Guardian Angels every Tuesday at 2:30 in the Chapel. Grief support is available in the parish through intercessory prayer, support groups and individual counseling. A group meeting is set up for every Tuesday evening from 6-7pm in the Multi-purpose Room in the Parish Center. For information contact the Parish Center at 262-5541. All Parishioners are invited and encouraged to attend this important Holy Hour offered for the sanctity of marriage and family life. Youth for Life works in conjunction with Together in Life to promote the Culture of Life to the students of Assumption Catholic School. 5th & 6th grade students gather for lunch and a brief presentation on a specific life affirming issue and end in prayer. For more information or to get involved, contact the Parish Center 262-5541 This group meets Sept-May. Meeting days may vary due to days off of school.